When selecting your real, farm-grown Christmas tree, do a freshness test by gently grasping a branch between your thumb and forefinger and pulling it toward you. Very few needles should come off in your hand if the tree is fresh. Shake or bounce the tree on its stump. You should not see an excessive amount of green needles fall to the ground. Some loss of interior brown needles is normal and will occur over the lifetime of the tree. Once you’ve chosen your tree, keep it in a sheltered, unheated area such as a porch or garage to protect it from the wind and sun until you are ready to display and decorate it. Below are instructions and information to guide you in caring for your Christmas tree. Find a tree recycling program near you. In the past, most Christmas trees came from the forest; today over 98% are plantation grown. Christmas tree farms add oxygen to the atmosphere, provide wildlife habitat, increase soil stability and are very attractive. Christmas trees are frequently planted on barren slopes or other cleared areas where no other crops will grow. Christmas trees take 4-10 years to mature. During that time, the farmer faces many challenges. Trees can suffer from too little or too much sun or rain, destruction by rodents, insects, disease, hail or fire, and overgrowth from bushes, vines and weeds, or theft from the field. 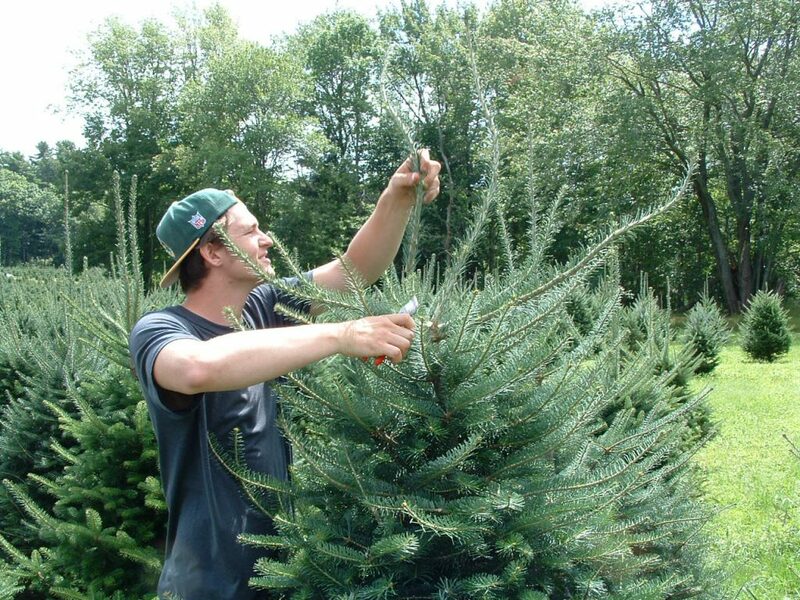 Christmas trees are shaped by expert farmers through annual pruning. By pruning upward growing branches, the grower can encourage the tree to branch more quickly, and gradually achieve the full bushy appearance consumers look for in a Christmas tree. The best choice has always been the natural choice, a real Christmas tree. Real Christmas are a benefit to the environment from the time they are planted until after the holiday season when they can be recycled. Real Christmas trees provide oxygen to the atmosphere while they are growing. Every acre of Christmas trees grown produces the daily oxygen requirement for 18 people. Artificial trees are a petroleum based product that consume vast resources during fabrication. A burden to the environment, artificial trees aren’t biodegradable and will remain in land-fills for centuries after disposal. The average life span of an artificial tree is only six years. Real Christmas trees, on the other hand, are easily reused and recycled. Christmas trees are biodegradable – the trunk and branches can be used as mulch for gardens, parks or in animal stalls. The mulch provides a protect barrier for the roots of other plants and vegetation while preventing weeds from growing. The mulch then decomposes, providing the nutrients plants need to thrive. Mulching programs are a fast-growing trend in communities throughout the nation. Check with your local department of public works for information. Some communities use Christmas trees to make effective sand and soil erosion barriers, especially at beaches and on river beds. Sunk into private fish ponds trees make excellent refuge and feeding area for fish. The practice of using a living tree to celebrate the holidays is gaining in popularity. Living trees have their roots in tact and can be re-planted outside following the holiday.